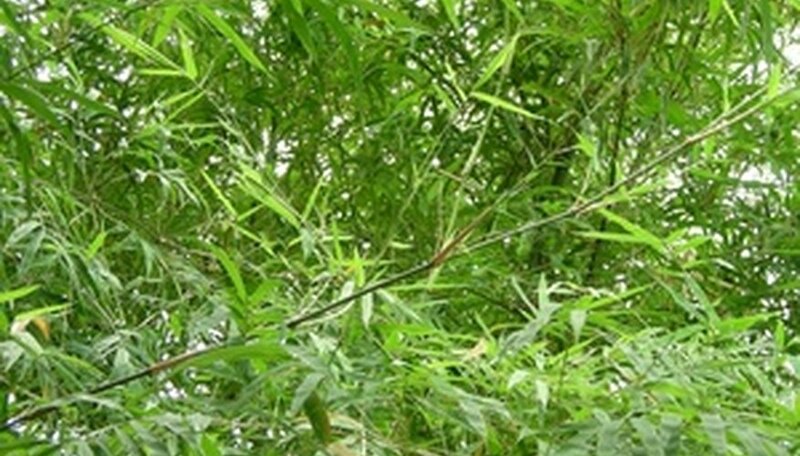 The Green Panda plant is a fast-growing, clumping bamboo that grows between 6 and 8 feet tall. This is a cold hardy bamboo that can withstand temperatures to -15 degrees F. Green Panda is also known as an umbrella bamboo as the older stalks have a weeping habit. There are a few different cultivars of Fargsias; some are taller and some grow slower. This type of bamboo is hardy to USDA planting zones 6 through 9 and makes a wonderful screen or hedge. Choose a location that has a few hours of full morning sun to part afternoon shade. Young plants will grow better if protected from the very hot afternoon sun in the southern climates. Green Panda will grow in mostly shade but will not be as vigorous or healthy. Spring is the best time to plant the bamboo. Dig a hole three times the diameter of the rootball. The depth of the hole should be 3 inches deeper than the rootball to loosen the soil so the roots can spread. Remove grass, weeds and stones from the dug-out soil. Amend the soil with one part compost, one part well-rotted manure and two parts original soil. Fill the hole with about 4 inches of amended soil. Remove the plant from the container and place it in the planting hole. Adjust the soil so the plant is sitting at the same level it was in the container. Fill in around the rootball with the soil until it is level with the surrounding ground. Multiple plants should be spaced 3 to 5 feet apart for a hedge or screen. Water the bamboo immediately after planting and daily for next 2 weeks. The soil should drain well and not leave the plant sitting in soggy soil. Continue to water 2 times a week for 2 months and once a week throughout the rest of the growing season. Fertilize the fargesia with a fertilizer made for bamboo plants or for turf grass once you start to see some new growth. Bamboo is a grass and will respond well to the high-nitrogen fertilizers made for lawns. Follow the manufacturer’s directions on how much to apply. Spread a 3- to 6-inch layer of leaf mulch around the base of the plants in late fall to protect the roots from the cold in any climates that experience frosts or freezing. This type of mulch will decompose and enrich the soil in the spring.